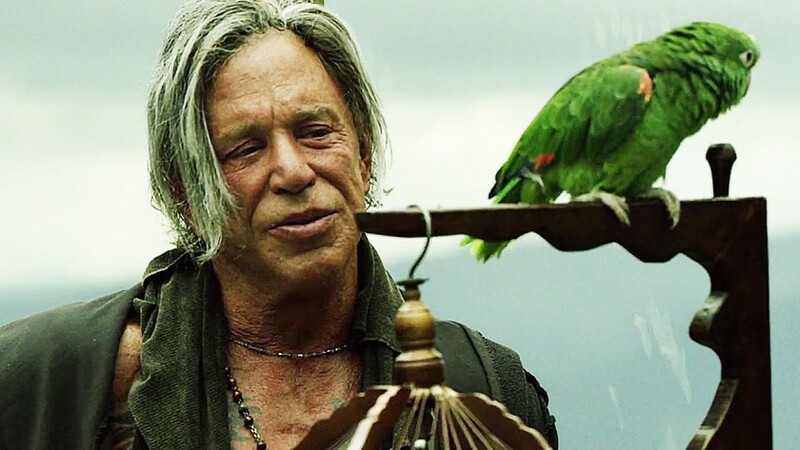 Mickey Rourke, even at the age of 63 and with a face like a ballsack, must add countless thousands to a movie’s takings. He’s listed as the lead actor of Blunt Force Trauma in all its promotional material. Clearly the gravel-voiced man’s man is a serious draw, which is apt for this film in particular, guns being the tools of choice throughout. Yet with 15 minutes of the movie to go – including the credits – Rourke is yet to make an appearance. His character, Zorringer, acts as one half of a diabolical pair of villains that brings the two actual leads together on an epic journey of talking, shagging, talking, shagging and the occasional duel, interspersed with a shag or two and a chat about this and that. Duels are the spool around which Blunt Force Trauma is wound. 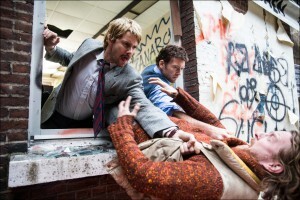 John (Ryan Kwanten) and Colt (Freida Pinto) are two gunslingers on a circuit of lunatics who don bullet-proof vests, step into a ring with an opponent and attempt to blast that opponent out of a circle etched around their feet. Shooting the opponent’s body anywhere other than their vest counts as a ‘foul’ and disqualification – this is more boxing than Bloodsport. This, the ‘game’, is an interesting idea and it’s evident throughout that there’s an engaging story wriggling around in here somewhere. But what we actually get is a twin tale: John attempting to arrange a duel with the mysterious Zorringer, who seems to be champion of champions in this game, and Colt attempting to find the man who killed her brother in one such contest. Considering John gets his wish only in the final reel and Colt’s quest is rather hamstrung by finding out halfway through that someone else has killed the evil ‘Red Dolan’ before she can have a pop at him, there’s an awful lot of screen time to fill with matters unrelated to plot. Best make the two leads attractive, and have them blather unremittingly about their respective personal histories and ride each other like beasts, because that’s never dull. The story feels bolted onto the central idea of non-lethal duelling, and the other scenes are tedious beyond imagination. The acting is entirely fine, though Pinto’s generic South American accent occasionally grinds at the eardrums. The script lumbers along – “No-one can say you aren’t what you are, John” – and Ken Sanzel’s direction is perfectly serviceable, but since he’s also the writer here he’s evidently bent on giving with one hand and taking away with the other. If a film can be saved by a single scene – and this one can’t – it’s worth highlighting that the all-too-inevitable duel between John and Colt is handled quite well. The duels in general offer respite from the inexorable tedium of most of the rest of the movie, which is too plodding to hold the attention, right down to possibly the slowest high-speed car chase in straight-to-DVD history. Blunt Force Trauma is a prime example of someone having a decent idea but not having the imagination to use it well (and giving it a title leaving little doubt it’s trying to be an ACTION FILM). The odd twist, any sort of break from the relentless predictability of it all, could have meant this one good idea not being wasted on an inane plot and limp script. But instead, they decided to Rourke the hell out of it.